Labor Day Weekend is one of the busiest times at Yellowstone National Park, and its famous geyser, Old Faithful, reels in 90% of the park’s 3.6 million annual visitors. To keep that geyser reliably spewing steam and water 140 feet into the air every hour or two well into the future, the park is surrounding the thing with pavement made from tires. Here’s the problem: To accommodate all those tourists, asphalt trails had to be built. As you can probably guess, asphalt isn’t a super sustainable material. So, the park created a new, 6,400 square foot “Flexi-Pave” pathway made out of 900 Michelin recycled tires that were ground up as part of a pavement mix. This mix was used to restore the old, existing trails. The tire-made material is way more porous than asphalt, which helps preserve and retain the groundwater Old Faithful needs. According to a press release, Flexi-Pave allows 3,000 gallons of water to pass through the material per square foot. How do geysers work? They erupt when groundwater beneath the surface becomes so superheated, that steam and water jet their way out of the ground. 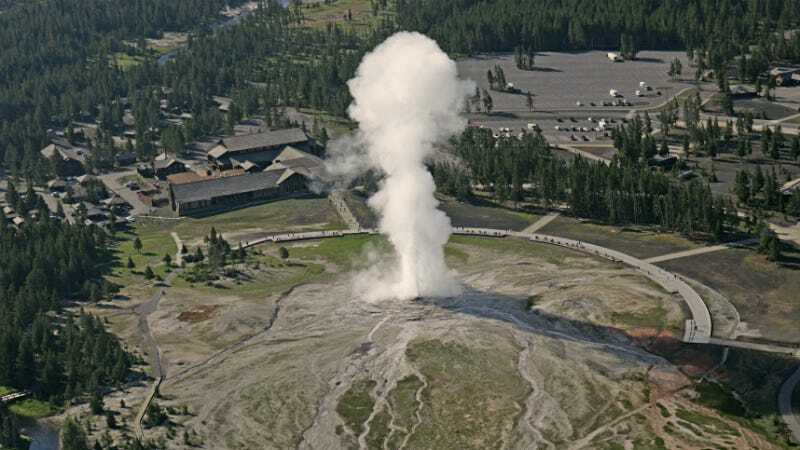 The new trail allows water to more easily return back down to Old Faithful’s aquifer, a body of permeable, porous rock that allows the passage of water into the ground. Yellowstone houses 60% of all active geysers on the planet. Meanwhile, the tires themselves came from service vehicles in Yellowstone. So of course, Yellowstone has plans on using the tire walkway model elsewhere in the park, too.